The substance medetomidine has proved effective in preventing fouling of ship bottoms. Researchers at the University of Gothenburg have now identified the gene that causes the barnacle to react to the substance, opening up the possibility of an antifouling paint that is gentle both on barnacles and on the environment. Fouling of hulls is a major problem for world shipping, for private leisure craft as well as large cargo ships. The University of Gothenburg has attempted to develop new, environmentally friendly methods that can limit marine fouling in several large research projects. One of these focuses on the substance medetomidine, a veterinary medicine that has been shown to prevent barnacle larvae from attaching to the hull. Now researchers at the University of Gothenburg are able to explain why. In cooperation with colleagues at the universities of Turku and Helsinki, Professor Anders Blomberg at the Department of Cell and Molecular Biology has succeeded in identifying and describing the gene that controls how barnacles sense and react to medetomidine. 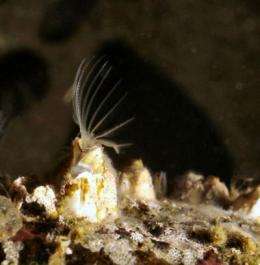 "We have found that medetomidine activates special receptors in barnacle larvae. The receptors emit a signal that causes the larva to swim away from the boat surface, instead of attaching to it. As the receptors are already activated at very low concentrations of the substance, this means that very low levels are also needed to be effective," says Professor Blomberg. The results, which are published in the scientific journal Molecular Pharmacology, explain how it is possible to develop an environmentally friendly and effective antifouling paint which instead of killing barnacles acts as a "deterrent". "Understanding how the substance works when it binds to the receptor also makes it possible to develop selective agents that only affect barnacles and not other marine organisms," says Professor Blomberg.